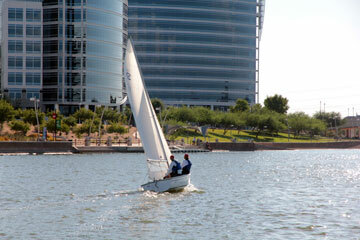 We’d like to invite everyone to the first Sailing Discovery Day at Tempe Town Lake on Saturday October 13 from 1pm to 5 pm. Stop by before you go to the Tempe Oktoberfest party! Who should come: Anyone who’s interested in learning more about sailing, sailing in Arizona, our club, or fun people in Arizona. We’ll have several types of boats there and with any luck there will be a comfortable breeze to take some rides and get your first sailing experience. We’ll also have information regarding classes and other ways to get involved in the sport of sailing!